Easily embroider continuous designs by gliding fabric through the hoop, ensuring design precision and effortless rehooping. A 4"x 7" (100mm x 180mm) area can be embroidered with each hooping. This small oval hoop is perfect for embroidering small patterns on sleeves, pockets or hard to hoop areas of pre-assembled items such as baby clothes and bags. This hoop measures 1-1/2” x 1-3/4” (38mm x 44mm). This small square hoop is perfect for embroidering small patterns and monograms on sleeves, pockets or hard to hoop areas of pre-assembled products such as shirts and bags. This hoop measures 2” x 2” (50mm x 50mm). This table is designed to support the additional weight of heavy fabrics and larger projects. Support your embroidery machine with this sturdy machine stand. This stand is designed for organization. 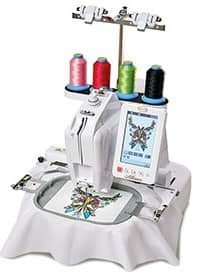 It stores all of your embroidery accessories, has wheels for mobility and can be adjusted to multiple heights.